In March of 2017, with Cygnus out of the water for the Winter, I had an opportunity to help with the delivery of a newly-purchased 40′ Albin trawler from Chattanooga, TN to Stuart, FL. Chattanooga? Yes, there is a way to get to the ocean from there. The Tennessee River goes West to the Tennessee/Tombigbee waterway, a man-made channel that runs South to meet up with the Black Warrior and Tombigbee Rivers, ultimately joining with the Alabama and Mobile Rivers and continuing down to Mobile Bay. From Mobile Bay, the Gulf Intracoastal Waterway can be followed as far as Dog Island, off Carrabelle, Florida. 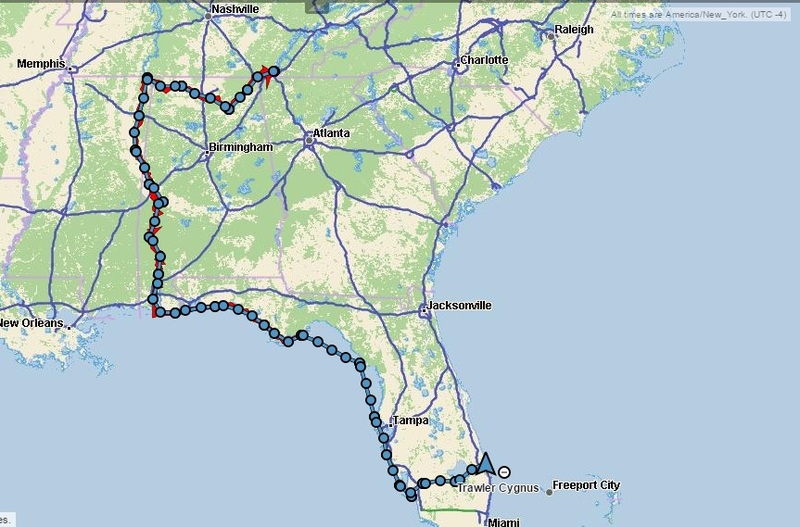 From this point, vessels must follow one of the only two open-ocean segments the Great Loop; crossing Florida’s “Big Bend,” before reaching the protection of the the Gulf Intracoastal again just North of Tarpon Springs. The Intracoastal can then be followed South to Ft. Myers, at which point it crosses peninsular Florida via the Okeechobee Waterway along the Caloosahatchee River, Lake Okeechobee and the St. Lucie River out to the Atlantic at Stuart, from where I flew home while the boat I had been helping deliver continued North along the Atlantic Intracoastal in the company of other “snowbird” vessels.